Ask fellow campers about "Yogi Bear Jellystone Park" and nearby attractions. Very hilly resort. All the services worked well. The road leading to the resort, King St., is rather narrow and if ones meets an RV going in the other directions things will be interesting. Our gravel site was not level, about 6 inches low in the rear and tipped to the right. In our area there were few trees so satellite connection was good. The resort does have cable TV but we did not try it. The resort provided a guide to help get to our site and set up. For the price we should have had a paved site not gravel/dirt and it should have been much more level. Over all we feel the resort is over priced. We camped at Yogi Bear Jellystone Park in a Motorhome. I stayed on a monthly basis due to working in the area. They would not apply my Good Sam's discount to the monthly rate stating that monthly rates were already heavily discounted. The park is clean and everyone was very kind. I enjoyed my stay there. It is a very busy park. Its a nice place to stay. My site was gravel and sites are close together. Very clean and large bath house. Nice laundry room. Both are heated and cooled. There is a pool, play area, outdoor theater, jump pad, and activities for children. When weather got bad we were able to go to an underground room. 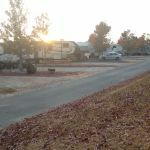 We camped at Yogi Bear Jellystone Park in a Travel Trailer. Walmart, and a few fast foods, grocery store and a little shopping center is 2 miles from location. The staff does a wonderful job with the children and are friendly and responsive to everyone. Sites leave a bit to be desired. Up a steep incline to a semi-flat area where we had to use blocks to stabilize and insure our chocks were firmly in place. The rate charged was convoluted due to a $6.95/person fee charged (no explanation to us seniors) and a $10 "site lockdown" fee all added to the base fee of $39. No clue about the site lockdown fee either - we made reservations; would our site have been given away if we'd arrived later in the afternoon? Plus - gates closed for security after 8pm. Minus - alligators on site in a penned area. Not too comforting when catering to children. 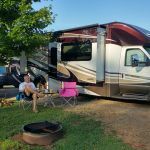 We camped at Yogi Bear Jellystone Park in a Fifth Wheel. We had as much fun as our 2year old grandson whom we brought here for a week. We were so busy! Turtles that u can touch, watch alligators in secure pens, arts and crafts every day, coloring contests, train rides, bubbl machines spewing bubbles galore, kiddie pool with umbrella spraying water, big pool, shelter with picnic tables, huge showers in spotless bathrooms. Our spot was small...roots of tree made it impossible to sit in our chairs besides camper but we could move the, down the site to more level ground. Seemed to be more campers that lived there long term then not. Their campsites were not up to par. The camp workers were absolutely fantastic! The best! We had a great time and would go back. We camped at Yogi Bear Jellystone Park in a Motorhome. We stayed in this park once before, when we were in this area. We did not realize it, until we arrived. The staff is helpful and friendly. They guided us to our site, pointed out our various hook-ups and made sure we knew their name, if we had any questions. The pull thru sites are level with ample space for your towed vehicle. We even had a small shade tree! We would stay here again! We camped at Yogi Bear Jellystone Park in a Motorhome. The sites are horribly unlevel. Some campers are sitting on two cinder blocks to level. The pool had 7 lawn chairs, no loungers. No pea gravel, only large rocks, not good in flip flops. Very loud train runs by. We camped at Yogi Bear Jellystone Park in a Travel Trailer. 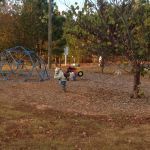 A great family park with lots for kids to do. Playground, miniature golf, and train rides. We didn't get level in our 40' motorhome but was good enough for our one night. We camped at Yogi Bear Jellystone Park in a Motorhome. This is a great family park I travel solo for work so I didn't care about activities but it was clean and had friendly employees. 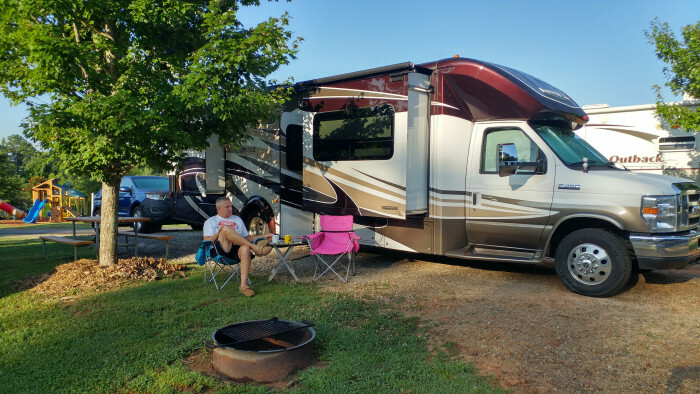 We camped at Yogi Bear Jellystone Park in a Fifth Wheel. Kid friendly park so if you have children this is your park. I was traveling through and was disappointed in cleaniness of park. The staff was cordial. We camped at Yogi Bear Jellystone Park in a Travel Trailer. The MOST friendly and HELPFUL park we've ever stayed in!!! We've been across the U.S. from Washington State to Georgia. Never had the kind of help we received at this park. They truly care that you are happy. The sites are basically not level no matter where you are for larger rigs. They helped us level our MH. In fact, went above and beyond to assist us. Plenty of room between sites (pull through at least) and lots of room for tow. The street is paved and the sites are gravel/dirt. Some have trees. There is a normal amount of space between the sites. The cable is good and is DirecTV to include HBO. Didn't have much luck with the wifi. The site has good 30/50 amp with sewer and water. The bathrooms are clean the showers are good size. This is really a well planned family park with lots of things for children to do plus there are activities for them. We were there off season, but they showed us all the things they have. There is a small store to include ice, ice cream, RV supplies and much more. We had good AT&T LTE service. Don't hesitate to come here especially if you have children. The staff is extremely helpful! We camped at Yogi Bear Jellystone Park in a Motorhome. We stopped for a night as we passed through. Rate above includes $6.95 per person. There are only two of us and didn't see what that charge actually bought us. Our site was not level but I didn't see any others that would fit a 45' coach with tow that were any better. Never got the coach level. Had rained a lot prior to our arrival leaving a lot of mud. The turn out of the space as I departed was very tight and confirmed our coach has functional posi-traction. Was good enough for overnight. Wifi was adequate. Didn't try the cable. Lots of channels over the air. Verizon signal strong. We camped at Yogi Bear Jellystone Park in a Motorhome. Came in about 8:00 PM, no reservation, just looking for a place to spend the night as we were very tired. I had driven through Atlanta rush-hour traffic, in the dark. We followed signs from I-20 to the park. When we got there, two people with flashlights came to meet us. They said the office is supposed to close at 8:00, but they are usually there quite a bit later. They had space available, and got us checked in and escorted to our site. I've never had friendlier service at any park, and it was very appreciated after the tiring day. I had always guessed that Jellystone Park was a place for kids, but I will definitely return after this experience. Couldn't have been treated any better. Price is a bit steep, but after the day we'd had I would have paid $100 to get a site! I highly recommend this park to anyone. We camped at Yogi Bear Jellystone Park in a Motorhome. Since I was just staying overnight, and had no children to enjoy all of the activities, the price was a little too high but for a family planning to stay a couple of days, there always seemed to be things for the kids to do. Although the sites are level they are terraced, so that your utility hook-ups are down a short embankment from your trailer. 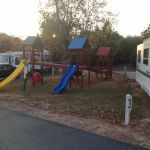 We camped at Yogi Bear Jellystone Park in a Travel Trailer. There is a Walmart not far from campground and pizza delivery is available at campground. Close to Carrollton, GA. Atlanta, GA and Chattanooga TN. Campground has activities for the kids and the pools are awesome. They also have a mini golf. Wal-Mart is literally give mins away! There were several children's activities. They accept PA but you have to mention it. Super Wal-Mart within 3 miles of campground. Are you affiliated with Yogi Bear Jellystone Park ?